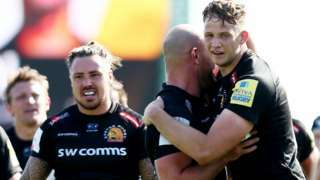 Defending champions Exeter set up a Premiership final against Saracens after beating Newcastle 36-5 in their semi-final. The Council of the Isles of Scilly has taken the action so it can comply with conservation laws. Thirty-four community projects have benefited from more than £100,000 awarded as part of Devon County Council and East Devon District Council's Parishes Together Fund over the last year. The two councils worked together, for the sixth year running, to put £1.10 per elector into the fund - £1 from Devon County Council and 10p from East Devon District Council. £8,364 towards providing mental health support for young people in Ottery St Mary, West Hill and Aylesbeare. £2,500 towards Christmas lights in Axminster. £7,482 towards providing a number of community helipads so the Devon Air Ambulance can land in the dark. More than £10,000 towards community defibrillators that the general public can access. £7,155 to Sidmouth Town Council to pay for the Sid Valley Help Scheme to help them support residents in their times of need. Clyst Caring Friends will receive nearly £5,000 to help them decrease loneliness in the area. It's funding that is making a real difference to residents' lives. The money is to encourage communities to work together to identify new ideas for their mutual benefit. It is money to kick start projects, available to help get good ideas off the ground. We'd like to hear from communities about projects that enhance and make a difference to communities." 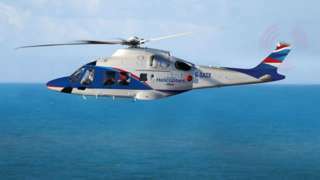 The company that is operating the new helicopter service between Land's End and St Mary's airports says it hopes to fly on Monday as planned. Earlier this afternoon the Council of the Isles of Scilly said it has "suspended" the service "with immediate effect" to allow more time for an environmental assessment to be done. The Isles of Scilly Steamship Group says it is "gathering information to assist the council in their decision making process to enable us to fly on Monday". The service is scheduled to launch on Monday. We do not share the Council's view and despite the very disappointing late notice, we are gathering information to assist the Council in their decision making process to enable us to fly on Monday. We will issue a further statement in due course." Ian To from Liddngton, near Swindon, is attempting to break the world record for cycling from Lands End to John O'Groats. He'll set off on Saturday morning attempting to complete the 840 mile route in under 44 hours, and may only sleep for less than an hour during the challenge. He's raising money for the National Autistic Society in the process. This evening it will stay fine with late sunshine. It will then be another dry night with mainly clear skies, although there could be a few patches of mist or fog forming and there will be light winds. On Saturday it will be another dry and fine day with long spells of sunshine and some patchy cloud. There will be a light breeze and it will feel warmer. Councillors say they are worried about plans to cut more than 100 Police Community Support Officers (PCSOs) in the South West. At the moment, there are 260 PCSOs across Devon and Cornwall with a target to reduce that to 150 by 2021. Councillors have heard that there would be an increase of 100 police officers at the same time, an "uplift" in armed response officers and an investment in evidence record takers. Police also said that there would be an investment in 50 staff investigators, 10 problem solvers and "significant investment" in volunteering. In the China Clay area they are fantastic community advocates, they are doing what they are supposed to do. If we don't have them it will be an absolute disaster. I live in a community where we are lucky that the level of crime is low, but the PCSOs are on top of what is going on." Ivybridge's new household waste recycling centre has been named the best in the country. The Let's Recycle Awards 2018 were announced at a ceremony in London this week, with the Devon facility beating others from across the country to the Civic Amenity Site of the Year prize. The centre, which opened last March, has a split level design making it easier for householders to use the waste containers, with no steps to climb. Another feature that appealed to the judges is that it is possible to change over the waste containers without having to temporarily close the site. A man who died after being hit by a car on the Penryn bypass "will be greatly missed by all that knew him", his family has said. Emergency services were called to the incident on the A39 at about 04:20 on Saturday 14 April. Carmeron Grieve, 41, from Penryn was taken to Derriford Hospital in Plymouth but died earlier this week, on 16 May. Devon and Cornwall Police are continuing to investigate and say "the female driver is assisting police with their enquiries". Network Rail has confirmed that it's hoping to extend the main railway line at Dawlish out into the sea. Experts say the dominant threat to the main line at Dawlish is not from the sea, but from the cliffs above. Network Rail is in the process of spending £15m of Government funding on ground investigations and survey work at key points along the Dawlish to Teignmouth stretch. It says its preferred solution to protect the line is to move it away from the cliffs and out into the sea. What’s important for us is to make sure we come up with the right solution at the right time to make the right interventions, not just this year and the next five years, but we're looking forward to the next decade...a hundred year time frame, taking into account climate change and sea-level rises as well. " Some local people are unhappy at the proposals but the local MP says there's no real alternative. Moving the railway line seems to me the only viable option and I think the key is to make sure we do it sympathetically so that we ensure that we keep as much of the beach as possible." Another key element of the plan is to build a second higher sea wall with a wave return along Marine Drive in Dawlish. Network Rail says the plan is go out to tender in 2019-20 and, if approved, the main works could be complete by 2021. Councillors have unanimously backed the expansion of the electric bike hire scheme in Exeter and east Devon. Devon County Council has approved a £240,000 plan to introduce 11 new cycle stations and the expansion of three others. At the moment, the scheme has 20 bikes and more than 700 members with about 2,000 trips registered since 2016. Sites at the Pinn Hill, Bishops Court Quarry and Seabrook housing developments have also been identified. An existing site at Digby & Sowton Station will be reinstated while those at Exeter Central Station, the Civic Centre and at Exeter St David's Station will be extended. Toddlers in Truro have been getting in the mood for tomorrow's celebrations with a 'Royal Wedding' themed party. A 'wedding breakfast' was set up at the Toddler Sense Newquay, Truro & Falmouth groups in Shortlanesend today, complete with a cake stand, play food and puppets. The children also had a royal castle to play in with thrones, and took part in a crown-making session. We finished with a lovely send off involving balloons, bubbles and flower petals... it’s really got us all in the mood for the wedding!!". The future of a popular garden centre is uncertain after plans were revealed to replace it with workspaces. Pre-planning advice has been sought from Cornwall Council for plans to replace Wyevale Garden Centre on Par Moor Road near St Austell. Plans show there could be seven two-storey units built on the site as well as 108 parking spaces. Wyevale Garden Centres declined to comment on whether the branch is set to close or how many jobs could be lost as a result. Will the royal wedding feature a Devon cheese cake? A cake made entirely of cheese is one of the highlights of the food pavilion at the Devon County Show. And it's milking the mooooo-d of the moment, adorned as it is with Royal wedding bits and pieces. It looks like is has been very caerphilly put together. Perhaps Prince Harry and Meghan Markle will be inspired? And if you don't like the cheese puns, maybe you can do feta? A new helicopter service between Land's End and St Mary's airports has been suspended, just days before it was due to launch. The Council of the Isles of Scilly says the decision has been taken to allow more time for a "Habitat Regulations Assessment" to be completed. The Isles of Scilly Steamship Group, who is operating the new service, had previously contested the need for an environmental assessment but legal advice received on Wednesday (16 May) confirmed it was required. A draft assessment has now been sent to Natural England. The service was scheduled to begin on Monday, 21 May. We do not take the decision to withhold consent lightly and regret any inconvenience this situation causes to passengers who have booked flights. A greengrocer's shop in Paignton is closing down after 26 years of trading. The owners of Louise's say they are hoping to sell the business as a going concern. They have also applied for planning permission, which would allow the shop to be converted for residential use. Three express-type supermarkets are now trading not far from Louise's in the Preston area of Paignton, but several small shops in the area are empty. M5 Devon southbound severe disruption, between J28 for A373 and J29 for A30 Exeter. M5 Devon - One lane closed and slow traffic on M5 southbound between J28, A373 (Cullompton) and J29, A30 (Exeter), because of a lorry having a tyre changed. Schools across Devon and Cornwall are celebrating tomorrow's impending nuptials by holding their own mini royal weddings. At Hooe Primary Academy in Plymouth, 10-year-old Rowena has been starring as Meghan Markle with 11-year-old George playing the part of Prince Harry. Their fellow pupils have been cast as other key royals, while headteacher Jake Daykin features as the Archbishop of Canterbury. Judging of the Angora fleece competition is under way. The hair of the Angora goat makes the silk-like fabric or yarn called mohair. It’s notable for its high luster and sheen. Mohair has even been used to make suits worn by England’s 2014 football team and Pierce Brosnan in his role as James Bond! The Red Arrows are currently in Greece, training for the upcoming season of events. As well as the RAF pilots, there is also a team of mechanics and engineers working to get nine aircraft primed to perform. One man, Corporal Chris Searle from Cornwall is 'Dye Team Captain' this year. You can find out more about what this entails by watching the video.